Virtual Dilemma: Squawking 7700 in an airliner, can Av8rdan save the day? I'm booked on a flight this coming Wednesday night, tickets bought, seats chosen, a nice short flight on a perfectly fine airliner. The destination is not known, because a friend bought this flight as a belated birthday present, so I'm happy to go along for the ride...to somewhere sunny, I hope. Michael Black on the flight deck of his full-sized 767 simulator. But today I get this frantic call from that friend, Larry Nostradamus, and he is SCREAMING at me to not get on that flight. "Something terrible is going to happen," he says, and it is kind of freaky how over the course of time, the ol' Nostmeister has been spot on with somehow predicting the future. Dude has quite a reputation of foreseeing big, knarly world changes, but he completely blows at picking Powerball numbers, or I'd be writing this from a lavish villa in the Tuscan countryside. As much as I want to listen to Larry, I have supreme faith in the airplane, and also the professional men and women who fly them. "But Dan," Nostradamus insists, "I just have this gut feeling something is going to prevent both pilots from safely bringing the flight back from cruising altitude. I see both pilots too ill to fly the plane...do NOT get on that flight!" "Nostradamus...listen," I answer with confidence, "I'm going to get on that plane this week, and everything will be fine. And even if your dire prediction comes true, dude, I can fly to a safe landing. It's just a airplane...O.K., a really, really big airplane." "Hmmmf," Nostradamus snorts, "we'll see about that, won't we?" Yes, in fact we will. Nostradamus is right...a massive health emergency will indeed knock both pilots out of commission on the airliner I will be riding in this week. I already know that because I'll be the only other trained pilot on the plane, and it will be my sole responsibility to jump into that important left seat and try to coax every ounce of aviation knowledge out of my brain to quickly figure out how to fly this large commercial airplane well enough to steer to a suitable airport, slow to approach speeds, remember to drop the gear, and land on the centerline. 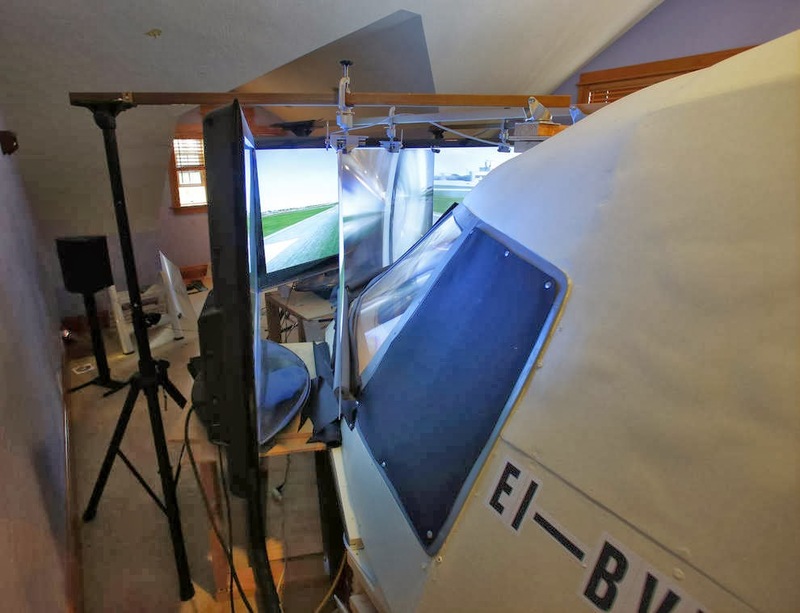 This whole exercise will be simulated of course, flying in Michael Black's DIY full-sized and very realistic flight simulator that he has built in his Eugene, Oregon home. Black has offered to let me conduct this experiment, one that I've always wanted to complete, but was kept on the back burner due to the extreme cost of full-motion airliner simulators. I will take a seat outside the sim, while Black sets it up cruising level in the flight levels with autopilot on. Once he has the airplane fat, dumb and happy, he'll come out, and in a scene straight out of "Airport 1975" will scream "OMG! Both pilots are unable to fly the plane...we are all going to DIE!" That will be my cue. "I am a pilot, I can do it," will be my response from seat 16F. I'll move into the sim and get to work trying to see what would happen if a 500-hour instrument-rated private pilot with zero airliner flight deck time could indeed draw upon hard-wired stick and rudder skills well enough to return the airplane to a runway without loss of life. I predict that I can do it, because this is just a wing being propelled through an air mass by engines. Airspeed is airspeed, and the wing on a large airliner should function in theory nearly the same as the big Hersey Bar wing on my Cherokee 235. I may not end up figuring out how to work most of the systems in this simulated emergency, but I think I can understand radios, the autopilot, trim and power settings sufficiently to get this plane back safely. Give me vectors to the numbers, I can do this. Black has about 7,000 hours flying real airplanes, as a professional pilot flying the Shorts 360 for Aer Lingus in Ireland and the U.K., and for Horizon Airlines flying the SA 227 Metro 3 in the U.S. After getting married to wife Shivaun, the idea of living out of hotels soured the pro pilot career for Black. He moved into retail after starting Eugene Running Company, a specialty running store in Eugene Oregon, which is known in the running community as "Tracktown USA. Today, Black mostly trades stocks after selling the store a few years ago, which also gave him the time needed to build his DIY home full-sized simulator based on the Boeing 767. "I was inspired to start this project after flying the Google Earth simulator on my PC," Black said recently in an interview with Airplanista. "I became curious as to what I could do to make a more authentic simulator and looked on the web for ideas. When I learned that people were building their own jet simulators, I decided that's what I wanted to do. There were plenty of examples online explaining how to build a jet sim, and I decided on the 767 as I owned the Level D 767 sim software for MS FSX and felt at that time it had the most comprehensive and realistic features. I looked at hundreds of photos from Google images, and since I have a hobby as a fine furniture maker with a wood shop at my home, the tools and skills were at my disposal to build my sim." "The sim uses five PCs that have Intel I7s chips running at 3.4 Ghz, 8 Ghz ram and Win 7 Pro at 64 bits," Black explains. "There is a main computer that handles the aircraft systems and four additional computers, each dedicated to run one portion of the cockpit view. For scenery, there are four 55-inch HDTVs with Fresnel lenses mounted in front. The Fresnel lens gives the 2D rendering from the television a 3D effect. Not a true collimated display solution, but it approximates it. In fact I require my glasses for distance vision as if I would if I were looking out a real window of an airliner. In the cockpit there is one touchscreen mounted on the overhead panel as well as three additional computer screens that illuminate aircraft flight and engine instruments. The main sim software is Microsoft FSX. On top of that, I use Orbix terrain enhancement and Gex weather software. The software that ties the scenery together is Wideview, which allows each rendering of view to sync together to create a seamless 220 degree field of view." Black, who admits his own computer skills are "lacking" says he had plenty of help with the sim's computing set-up. "My friend John Beasley, a computer tech and former Air Force U2 mechanic, was invaluable in assisting me with programing and networking. Thanks to him this simulator has taken life," he said. Exterior of Black's full-sized simulator...in his home. "The throttle quadrant, which includes the flaps, fuel shut offs etc. came from a decommissioned Boeing 757," Black said. "I found that on eBay and then had the unit wired to be able to use with Microsoft FSX through a company in Florida called Northern Flight Sim. They added modules and adjusted friction for each lever. I also bought Weber 737 pilot seats on eBay that I embellished to look more like the real 767 seats. Other parts I bought from eBay include various flight and engine instruments that are essentially "dummy" instruments. Also bought exit signs and a set of first class passenger seats to add to my office sitting area. My office is just behind my simulator. All the other aspects of the sim, including the cab, windows and exterior were basically built with building supply store parts, such as 2x4s, MDF, plywood, Plexiglas and really good gloss paint. Interior color was color matched and I used spray acrylic to create the true Boeing Brown. Many of the instruments, including the autopilot and radios, are made by companies who develop specific look and work alike models of real parts. In fact my yokes are not from a real aircraft, but was manufactured by a company in Canada called Ace. The yokes are essentially real 767 yokes in look and in feel. It is essentially a USB plug and play device. Most of the radios and components come from a company in Europe called Open Cockpits." As one might expect with a project of this magnitude, the costs involved are staggering. But even as the bill approaches $40,000, Black says it is money well-spent. 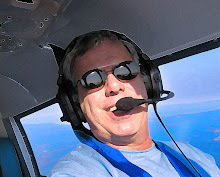 "My wife understands the needs for my aviation fix, and she knows that in the long run, [the simulator] will save us rather than renting aircraft all the time. She actually thinks the sim is pretty cool and doesn't regret that we have it. In fact, we've added on to an existing closet in the sim room and that is now our master bedroom. It's like a first-class section that we can walk through to enter the sim." Even while this sim appears even to a pilot's eye to be very authentic, it is still a work in progress to Black. "The building of this sim is fun and one can get lost in the details. There continues to be things I can add to it to make it more and more authentic. I have yet to join the VATSIM community that essentially is a virtual air traffic control system. The list of things one can do is limited by ones imagination. There are websites online that are dedicated for the home sim builder. The projects that people are doing all over the world are amazing." (1) I will either figure out that a wing is a wing, and that airspeed can be controlled to a level sufficient to find an airport, drop "three in the green" and land safely. Or, (2) I might also fumble and stumble through the air, lose control of a very expensive virtual airplane, and end the flight in an embarrassing crash that will no doubt generate a TON of virtual paperwork with the Virtual NTSB and FAA. Yes, all those virtual people in the back have a lot riding on the outcome of this experiment. They just want to get to their virtual grandma's house. With any luck, I can save their day, become a virtual hero, and see myself on the virtual 6 o'clock news. Because the alternative might get virtually messy.